Thanksgiving 1948 North Quincy handed Quincy an 8-6 upset. Pres Hobson of The Patriot Ledger had predicted a Quincy win. The prediction was fuel for North's fire and The Red Raiders entered the game with tremendous determination. Quincy scored first when Jack Granville intercepted a pass and ran 59 yards for a touchdown. The Red Raiders found two easy points when Ronnie Wrey tackled a Quincy player in the end zone for a safety. The first half ended 6-2 Quincy. In the second half a Quincy pass was intercepted by North's Bob Welch, on the Quincy 27. Welch then made it to the 14 before Jack Gilbody turned to the air. Gilbody overshot Jack Worthley in the right flat but Worthley had been grabbed by a Quincy defender and the interference gave ot to North on the two yard line. John Santuosso then bulled over for the touchdown and the score remained 8-6. Quincy wrenched the City Championship from North in 1949 by a score of 25-0. The Presidents received all they could handle from the steamed Red Raiders, particularly in the first half but the losers couldn't collect on their chances as they gave Quincy so many. Coach Donahue said that the story of this game is wrapped up in those interceptions by Quincy. Larry Curtain was Quincy's expert at interceptions-he turned the game into a presidental parade. This parade would last for the next four years, three of which finds North scoreless. 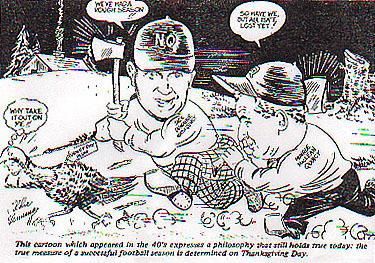 Turkey Day 1950 saw Quincy defeat North by a score of 20-0. Quincy's three touchdowns were scored on their "bread and butter" display of the T-formation. The sloppy field hurt both teams in their offensive tries leaving them with a scoreless first half. But Ken Balducci with his fiesty red socks broke the ice in the third quarter for Quincy. Then Jerry Frazier added two more and the game was out of sight. In 1951 Quincy's team for the third successive season demonstrated that they once again overpowered North this time by a score of 21-0. Jerry Frazier's running ability was the key factor in the victory. The President's had little trouble with North's plays. Quincy was ready for everything. Coach Munroe MacLean admitted Quincy had scouted North very well and their homework had paid off. 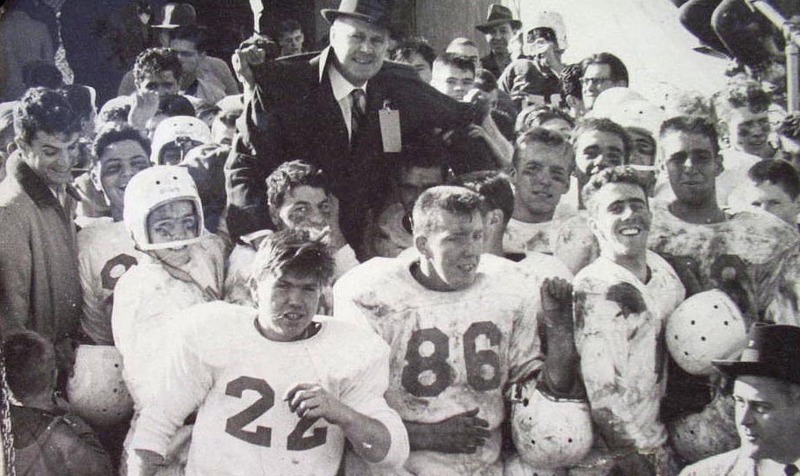 Head Coach Bill Sullivan's first team stomped over North by a score of 32-19 on Thanksgiving Day 1952. The President's triumphed by exploiting every opening which the Red Raiders gave them in opportunistic football. Quincy's gaurd Tony Quintiliani set the pace by running 68 yards for a touchdown with a North fumble in the first period. This was an unusual fumble recovery-Tony picked the ball off the shoulder of a North player. All in all, this was a day for strange happenings. At the half (with the score tied 13-13)Quincy hadn't even had a first down. By the end of the game, Norht had a phenomenal totla of 26 first downs to Quincy's 5! Also North had 416 yards rushing to Quincy's 137 and yet the lost! Quincy recovered 5 North fumbles that day and North never had to punt during the game. North's victory over Quincy in 1953 by a score of 20-7 was their first victory since 1948 and their largest margin of victory since 1935. The key for Norht was Joe Crowley 152 lb. senior with built in drive who made three touchdowns. He was the highest scorer in North's history. His assistant was man-mountain Vin Penzo who place kicked two extra points. North established general superiority in both statistics and pattern of play but Quincy managed one touchdown on a stuning 46 yard run by Jim Russo. The crowd at Turkey Day 1954 watched Quincy beat North by a score of 18-0. The field was in surprisingly good shape at the start of the game but soon was a quagmire due to the steady rain during the event. Quincy Coach Bill Sullivan used a new angle in defeating North. He eliminated the huddle and had the boys line up immeadiatley with the hope of running off the play before the opposition was set up. 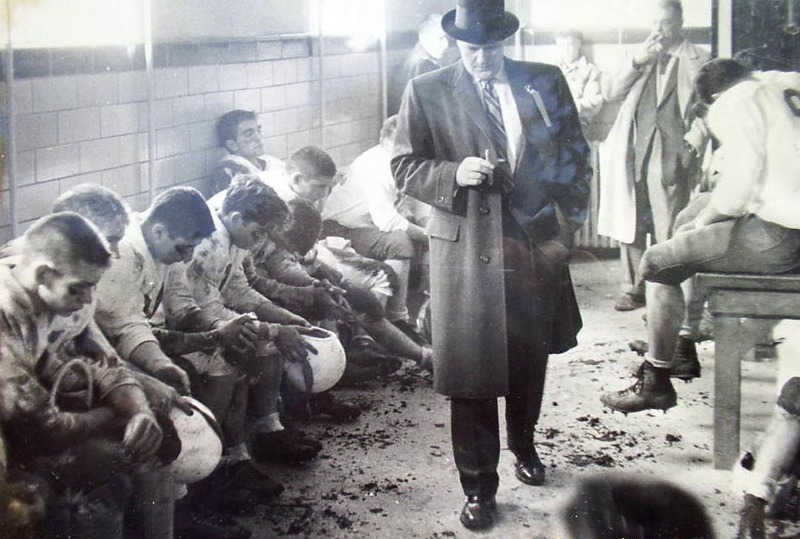 The idea worked but was a problem because of the wet field - referees insisted upon drying of the football too frequently. Quincy's scoring was composed of one long gainer by Jim Colclough and two short runs by Jim Russo. The Red Raiders just couldn't handle the superb playing of Quincy's Vinnie Moscardelli, and Lou DiMartinis. This article was sent to this humble webmster by Ron Ivil.